When someone mentions Brooklyn, different people will probably have different perspectives. Everyone has their own version of this NYC borough. Whatever your version is, there is no doubt that Brooklyn is quite legendary and it is an integral part of New York City. In this article, we have decided to present to you the reasons why Brooklyn is the best NYC borough. Who knows maybe after reading this article you will be one step closer to choosing between New York neighborhoods to call home. Therefore, take five and read the text to find out more. First of all, let us say that Brooklyn is the most populous of all five NYC boroughs. 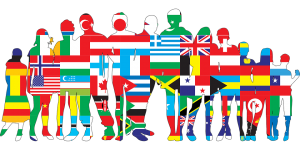 With more than 2 million inhabitants you can expect to see and meet many different types of people. Some people say that while walking the streets of Brooklyn you will get a feeling as if you were traveling the world. And that is true. There is something completely different waiting for you behind every corner. Every new street is a new opportunity to meet someone new. And while we know we mentioned the word ‘new’ quite a few times, it is just a way to emphasize why Brooklyn is the best NYC borough. Precisely because of this opportunity to enrich your life with a different content. Every new acquaintance brings lessons. And if you give a chance, you can learn so much from every person you meet. Brooklyn is truly living diversity. 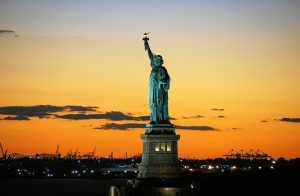 If you are an adventurist and enjoy learning and discovering more about other cultures, then this could be one of the strongest reasons for relocating to New York. Brooklyn is definitely the best place to feel it and experience it fully. All of that diversity makes Brooklyn so much dynamic and exciting. One of the best parts is that everything seems to be in a perfect harmony. Brooklynites are known to have developed a sense of strong community. So, even if you have relocated alone to Brooklyn, you will never be alone. Trust us, there is not a chance you will not find a friend here shortly after your move. For those of you who have had some fears whether the Kings County would be a safe place to raise a family, then let us tell you one more reason why Brooklyn is the best NYC borough – it has everything your family would ever ask for. It has walkable streets, more than beautiful, spacious parks where your children could play and where you could spend pleasant weekends, taking some rest from hard days of work. Perhaps your children prefer going to the zoo? No worries, Prospect Park Zoo is so amazing with a huge selection of various types of animals. Your children will be thrilled as they are walking through the park, discovering the new species of animals. Turn to help to a reliable NYC moving company to advise you which neighborhood in Brooklyn would fit your needs. We suggest you settle for the one which meets the most of your requirements. Only that way will you be able to be truly happy and discover all the potential this part of New York definitely possesses. We are sure you will enjoy exploring this borough together with your children. Our suggestion is to take them to Brooklyn’s Children museum which has a great program with a large number of diverse types of exhibitions. It is divided into categories so that it would suit the child’s age! One thing’s for sure – you and your children will have so much fun! Then, take a tour to see other cool places and things in Brooklyn. There are other museums you can pay a visit. Or, see the Statue of Liberty from another angle. One of the great things about Brooklyn is that there are so many festivals throughout a year. Most of them are completely free! One more thing why so many families opt for Brooklyn is that you can find a property which is less expensive but more spacious. And even though Brooklyn is not so cheap when you compare it to other places in the USA, it is still more affordable than Manhattan or Queens. Actually, when you are moving to New York, the costs of living in NYC is also something you should think through before you make the final decision. A bonus to a cheaper housing is that you can find apartments with a roof entrance from which you can enjoy a beautiful view of Manhattan, especially during the night. Furthermore, if you happen to live on a ground floor, you might even be lucky to have your own backyard. 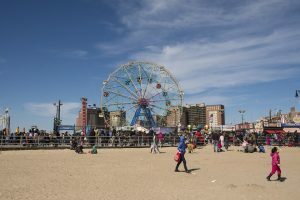 During summer days, hop on a subway and go straight to Coney Island and take a dip in the ocean at Brighton Beach. There, many fun activities await such as playing at the beach, or a nearby amusement park, etc. This place is perfect during those hot summer days if you just want to take a rest from the busy streets of New York and enjoy your free time during a weekend. Fun weekends at the beach. In recent years, Brooklyn has been recognized as a place where young professionals come in pursuit of their careers. As a result, Brooklyn is now home to thousands of start-ups and you can actually feel the energy pulsing around the borough. To add, a great number of young artist and writers are to be seen around here, as the Brooklyn art scene is flourishing like never before. We have given you just some reasons why Brooklyn is the best NYC borough. However, as soon as you relocate here, we are sure that you will find your own reasons. The point is, Brooklyn will never disappoint you!